3 Year Manufacturer Warranty Inc. Tackle your laundry with confidence with this Blomberg integrated washer dryer. Neatly concealed thanks to its integrated design, it handles large loads with ease. The Blomberg LRI285410W has 16 programmes to ensure you can always find the optimum setting. Washing delicate garments by hand will be nothing but a distant memory. There’s also a fast programme that washes and dries, giving you clean, dry clothes in under 40 minutes. With the 1400 rpm spin speed, plenty of water is removed after the wash cycle, making the drying process more efficient and saving you time. To ensure you always have room for that mountain of clothes, the Blomberg washer dryer has an 8 kg washing and 5 kg drying capacity. That means you have plenty of room to wash bedding and other bulky items that you’ll put on the washing line, as well as being able to wash and dry a respectable 5 kg of laundry in one go. This Blomberg machine has a low energy efficiency rating of A, so you won"t damage the environment, or your bank balance, every time you use it. The LRI285410W also uses very little water while providing optimum performance – perfect if you’re on a water meter. Separate washing machines and tumble dryers require extra floor space compared to a combi appliance – a definite advantage of this Blomberg integrated model. It has a 60 cm width, which is a manageable size that will easily fit into most homes. Even though this is a built-in washer dryer and therefore made to be concealed behind a kitchen cupboard door, Blomberg haven"t skimped on style. The crisp, white finish and digital display give a modern, minimalist feel. It is unassuming yet elegant. When you use an appliance a lot, you need to know it"s safe and durable. 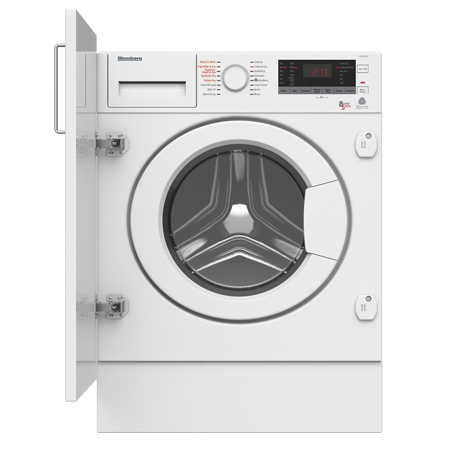 The Blomberg LRI285410W has a unique overflow security feature to prevent flooding, plus the assurance of a three year warranty. This is a machine you can rely on. Find out how this Blomberg integrated washer dryer can make laundry easier. Buy today. Pay an initial 10% Deposit of £57.00. A £29 settlement fee is payable at the time of final payment. Settle the balance in 12 months interest free. 7Kg Washing Machine with 1400 rpm - A++ ..